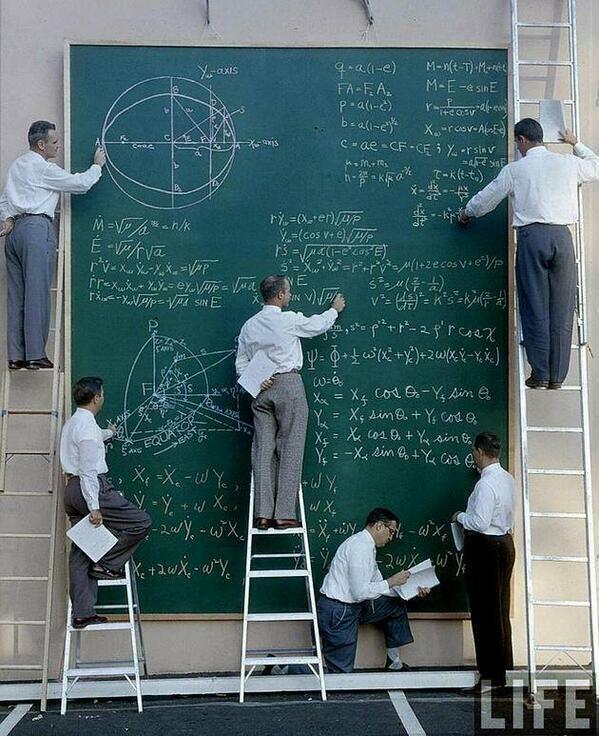 Claim: this is a photo of NASA before PowerPoint in 1961. The claim is false: this staged photograph was actually taken in October 1957. NASA was established on July 29, 1958 when president Eisenhower signed the National Aeronautics and Space Act. Getty Images caption: Six unidentified scientists uses a ladders and a large chalk board to work out equations for satellite orbits at Systems Labs, California, 1957. According to several sources, this photo was taken just six days after the Soviet Union had launched Sputnik 1. One reference: The Space Equation (Reader’s Digest APAC 2016). Google’s LIFE magazine picture collection contains more photographs that shows how the photographs were staged. Hidden Figures movie contains several scenes with similar blackboards and ladders. However, I have not found any NASA photographs which would prove that blackboards and ladders were actually used. If you have information about this topic, please leave a comment. Heerlijk: het leven voor Powerpoint (maar hoax) | X, Y of Einstein?